Jeff Wayne deserves considerable praise for breathing new life into this timeless classic. To steal the first five words uttered by the original narrator – and the story’s main protagonist – Richard Burton; “No one would have believed” that a prog rock double album, and a rock opera at that, released in 1978, at the height of the punk era, would go on to become the 38th best selling album of all time in the UK: racking up worldwide sales of in excess of 14 Million in the process. 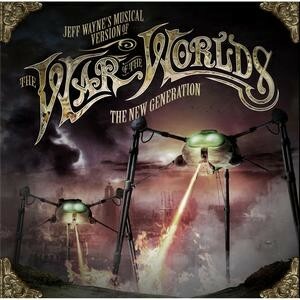 Over the past eight years or so Jeff Wayne has brought his rock opera masterpiece back into the public consciousness through anniversary re-issues of the original album and series of hugely successful concert tours. With that in mind, he obviously feels the time is now right to unleash a completely re-recorded version of his famous re-telling of the classic H.G. Wells novel; featuring an all new cast of performers. Now this can be fraught with all sorts of problems, where restless naysayers and lovers of the original piece will be sharpening their knives to immediately pronounce it inferior and declare what’s the point! Yes, for the purpose of this review I have listened to ‘The New Generation’ alongside the original and I think Wayne has done a wonderful job in hauling this prog rock behemoth into the 21st century. For starters, the modern, fulsome production gives the new version an aural clarity that all the re-mastering in the world could never achieve with the original. To his eternal credit, he hasn’t messed with any of the original themes of the piece either, preferring to tinker round the edges by adding some new nuances and flavours as well as additional dialogue here and there that only serve to complement to original score. What may have some purists heading for the hills though is a more bombastic use of modern pop/dance influenced synthesisers and electronic drum beats, which are most evident on the main ‘Dun-Dun-Dah’ theme; but considering that he is trying to appeal to a younger audience and the music has always had chart bothering potential anyway, I think it works very well. Liam Neeson assumes the role of the Journalist and narrator. His expressive brogue is no less effective than Richard Burton’s original dialogue: I’d stick my neck out and say its better! In fact, the performances right across the board, from Take That’s (never thought you’d see them mentioned in these pages!) Gary Barlow, who takes on the role made famous by Justin Hayward, to the idealistic Artilleryman, played by Ricky Wilson of The Kaiser Chiefs, seem more assured and right on the money. They are all outshone, however, by rising R&B/soul star Maverick Sabre who, as the crazed Parson Nathaniel, duets with soul songstress Joss Stone on a simply awe-inspiring rendition of ‘The Spirit Of Man’. Whether ‘The New Generation’ finds a new audience remains to be seen but Jeff Wayne deserves considerable praise for breathing new life into this timeless classic.